While I know I want get to sew as much as I want to, or blog every day, I am making an extra effort for this month as National Sewing Month. True, every month is sewing month for me. But this is National. So I am trying to do extra. Everyone loved the "back" of my quilt yesterday. I am now calling the scrappy side the front! Clearly the "unplanned scrappy" is my forte. 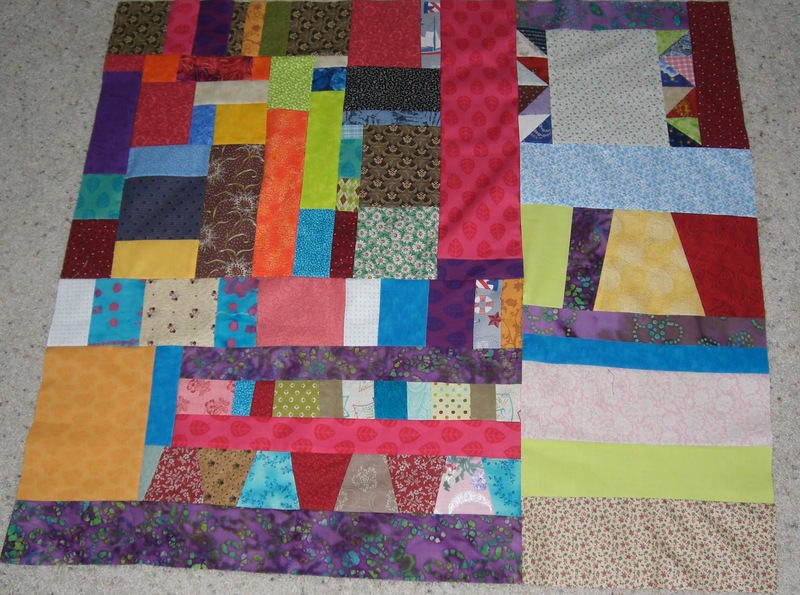 I decided for a clean up project to take lots of scraps and make cloth from it. Here is my top so far. Right now it is not square, but it has more to go yet. I used some tumblers I already had cut (two sizes of them.) I also used some small half square triangles that I had made as leaders and enders. There are scraps in this from several different projects. I think it is just fun! 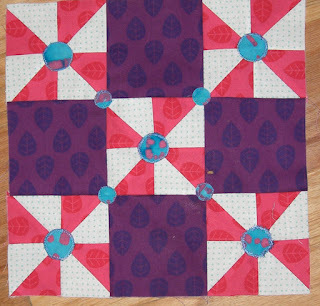 Have you ever tried just sewing various pieces together and seeing what you come up with? I highly suggest it. 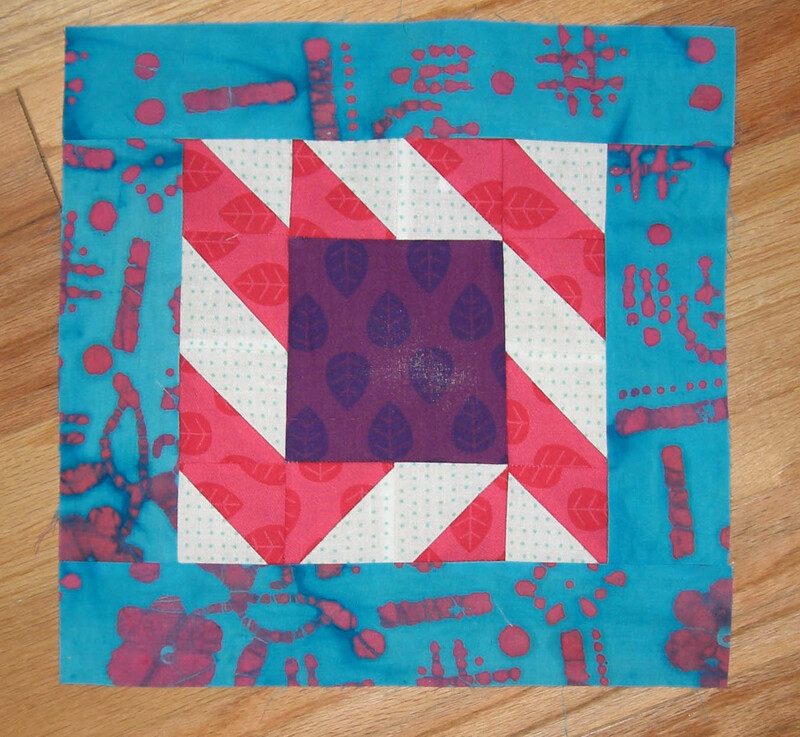 I also used up some "spare parts" from making the Beginner's Quilt Along block 13. I didn't really plan it, just started sewing. I wasn't happy with Block 13 since the points were so bad. So - Wonder Under to the Rescue! I added fusible to the back of some batik and cut circles from it. Then I fused them over the points - even the row joining points that did match! I thought it helped to complete the design. Now, how fun is that? 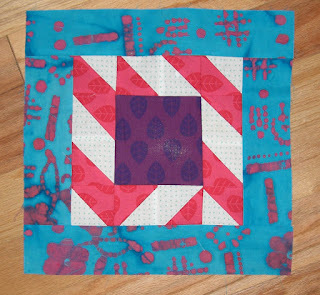 I love the circles idea - it's better than buttons b/c it makes it so much easier to quilt and gives the same effect. 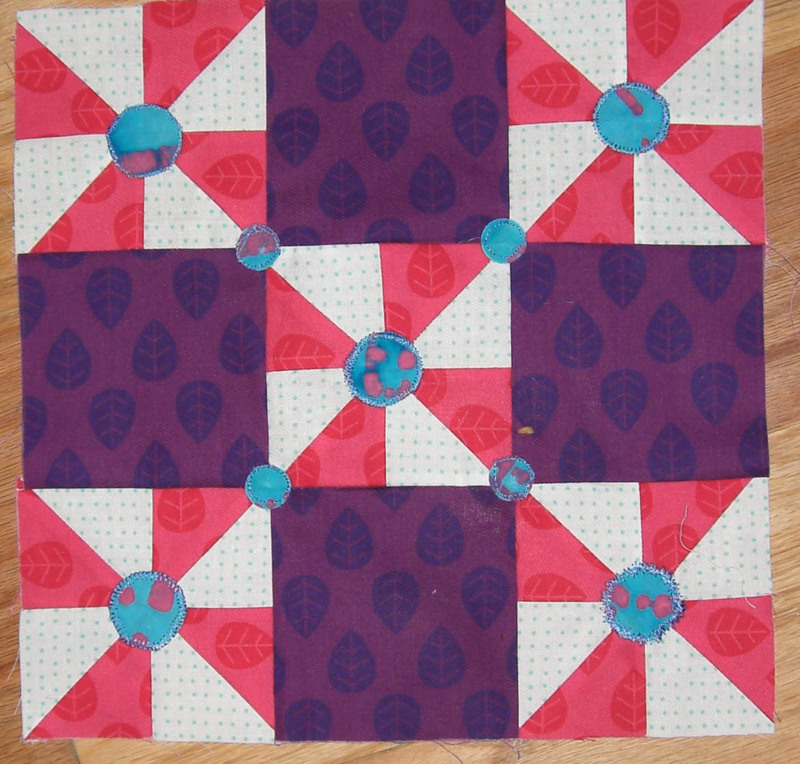 Also love the "free-form piecing" using up extra pieces. Great idea for using leaders and enders too. Sneaky use of Wonder Under! About randomly making cloth from scraps, I've done it but not as wonkily. Your cloth is much more interesting and eye catching! I love your free format scraps! Lately I find I've been using my scraps for swap blocks so they tend to leave my house. Maybe I should do something like this, then I would get to enjoy my scraps. Love your circle solution too! I just love how you just wing it....you let the fabrics and project tell you which way to go and you never come up wrong. looking great! those scraps just sing.